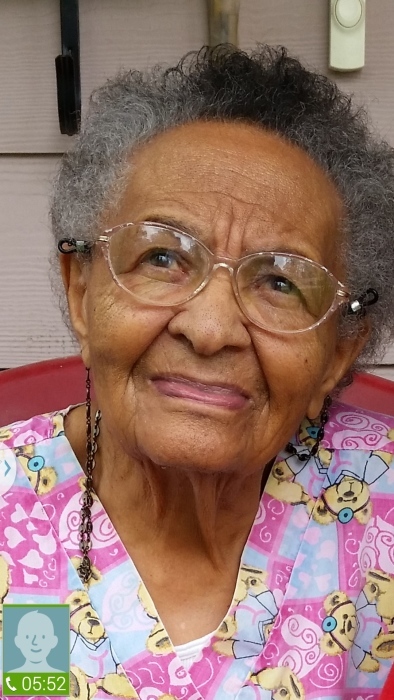 Thelma Beasley 98, of Cleveland Texas, passed away on Saturday April 13, 2019. She was born on Monday October 18, 1920, in Waldo Arkansas, to Coleman and Daisy (Askew) Beasley, both of whom have proceeded her in death. Thelma was also proceeded in death by her spouse, Cagie Hammond; children, Archie Lee Beasley, James Gordon White, Bobby Ray Beasley, Paul and Charles Glen; brothers, Harold and Paul Beasley; sisters, twin sister, Mattie Terry, Marguerite Jones, Yvonne Gonzalez; grandchildren, Danny Rone, Alton Burnett, and Stephanie Hammond. Left to cherish her memory is her loving children, Tommy Glen, Joan Mikle and husband Isaack, Patricia Gilkey and husband Dennis, Sr., Leslie Konarske and husband Gary, Vernice Beasley, Carlene Wyrick and husband LaQuincy, Myrlene King and husband Claudy, Mary Beasley, and Vanessa Bogany and husband James; 37 grandchildren; 84 great-grandchildren; 28 great-great grandchildren and 5 great-great-great grandchildren. Visitation for Thelma will be held at C.C. Driver Church on Saturday April 20, 2019, 9 am to 10:30 am. Service will commence at 11 am. Interment to follow at Pace Stancil Memorial Rest Gardens, Cleveland, Texas. Pastor Elroy Burnett, officiating.